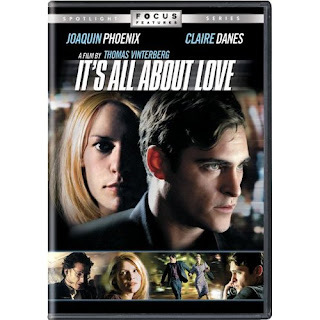 Exceptional Mediocrity: Worst Films Part 1: "It's All About Love"
The year is 2021 and the entire globe has been enveloped by strange meteorological and geophysical shifts in the fabric of the universe. For some reason these changes manifest themselves most potently in Africa where people begin freezing to death and the earth’s gravity randomly fails leading to scenes of floating children and goats. The rest of the planet is being thrust into a permanent winter which threatens the existence of mankind (and presumably the Summer Olympics.) All of this constitutes a future so grim that people’s hearts are beginning to randomly give out as they go about their daily lives, a condition the film refers to as “the sadness.” About 90 minutes in, I too worried that I might have contracted it….. The first character we meet is a professor of Polish literature named John, played by Joaquin Phoenix, who arrives in New York City to finalize his divorce to Elena, played by Claire Danes. Elena is a professional figure skater, a sport that has apparently become so lucrative that organized crime now owns most of it, and her appearances generate enough revenue that the mob paid a scientist to clone her several times. The inexplicable plot thickens when it is revealed that the mob has hired a professional hitman to deep-six Elena so that she can’t blow the whistle on their figure skater cloning workshop. For reasons known only the director, the hitman decides to off Elena during a dimly-lit practice session with a collection of her clones. His poor eyesight combined with the insufficient lighting of arena results in him shooting all of the clones (one graphically in the buttocks) but missing Elena herself. Astounded that an organization comprised of career criminals would betray their trust, John and Elena are forced into hiding during which they rekindle their mutual affection. As if John and Elena didn’t provide enough emotional gravity in a film centered on the attempted assassination of a genetically duplicated figure skater, we are soon introduced to John’s brother, Marciello, who is portrayed by the ceaselessly optimistic Sean Penn. Marciello’s scenes all take place on a plane because he developed a debilitating fear of not flying after overdosing on a prescription medicine to prevent air travel anxiety. He is apparently condemned to spend the rest of his life chain-smoking in coach on a commercial airliner while delivering soliloquies on human relationships. As the movie progresses, we find fugitive couple John and Elena traveling deeper into the worsening arctic winter on a train which soon becomes stranded by the record snowfall. The couple stumbles out into the barren landscape and travels several miles on foot before freezing to death in each other’s arms. Their film’s final few minutes cut between John and Elana’s lifeless bodies and Marciello’s monologue as his plane runs out of gas and is unable to land due to said blizzard. If you think the storyline is intriguing, Vinterberg’s eye for detail will astound you. · All cars featured in the film are 2002 models or older even though they would be 20 years old given the timeframe of the plot. · Not even upscale New York hotels are equipped with card readers; guests are still issued keys. · The FAA has apparently repealed its ban on smoking in an aircraft. · Although human cloning has been perfected and commercialized, passenger trains are still lack the technology to detect accumulated snow 100 yards ahead. · The dialogue sounds like it was recorded on a refurbished Playskool boom-mike which means that we miss most of the cringe-inducing Polish accents. · It reminds aspiring directors that you do not need logic or a solid script to attract A-list thespians. · It probably marks the first time the main character in a feature film is a professor of Polish literature. · Since all of the main characters die, it is unlikely that we will be graced with a sequel. I can truthfully say that this film is a masterpiece of bad cinema. Richard Roeper remarked “It’s like Kubrick with a talent-ectomy.” The New York Daily News insisted that the director must have been “high on some inert gas.” The New York Times announced that “Mr. Vinterberg tests the limits of absurdity.”Rumor has it that Clare Danes was so distraught by the finished product that she broke down weeping and has subsequently disowned the film. Get in line Clare; at least you got financially compensated for the time you dedicated to the film. This film has been rated R by the Motion Picture Association of America for incoherence, gratuitous ice-dancer themed violence, a scene of feigned sexual attraction, and moderate use of Sean Penn.